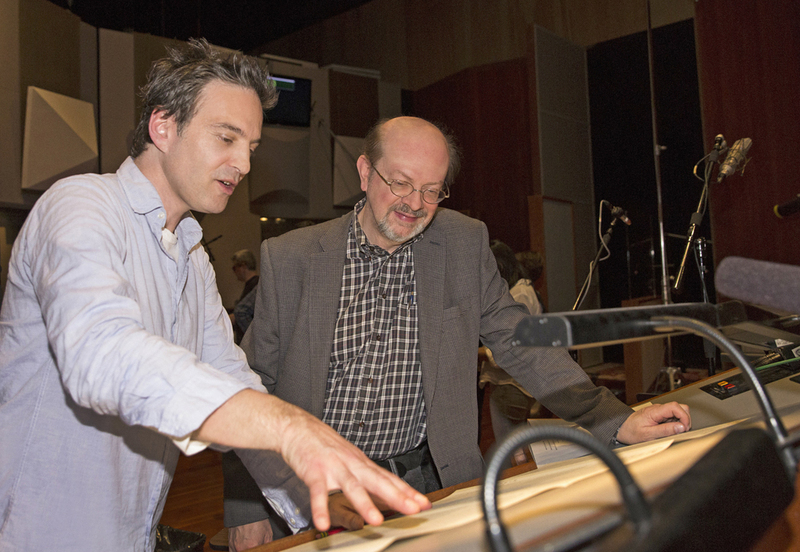 Composer Jeff Russo showing JB his arrangement of the original Trek theme during a scoring session for the CBS All Access series STAR TREK: DISCOVERY in Los Angeles, Ca. Photo Cr: Lisette M. Azar/CBS © 2017 CBS Interactive. All Rights Reserved. On January 15, I was invited to the recording session for episode 15 of Star Trek: Discovery, the season finale of the CBS series. It was all very mysterious. All we were told was that something special would happen and that we could not give anything away until after the show aired on February 11. It turned out that the Discovery would encounter the USS Enterprise in the closing minutes of the show; that composer Jeff Russo would, appropriately, invoke Alexander Courage’s original Star Trek fanfare; but even more importantly, Russo was going to conduct 74 musicians in a fresh new version of Courage’s famous Trek theme (complete with wordless soprano solo, beautifully performed by singer Ayana Haviv) that would play under the show’s end credits. Here is that story, published in Variety the next day. This entry was posted in Composers, Interviews, Television Music and tagged Alexander Courage, Ayana Haviv, CBS All Access, Jeff Russo, Star Trek fanfare, Star Trek theme, Star Trek: Discovery, Variety on February 12, 2018 by Jon Burlingame.